Marukin Ramen is supposedly one of the most famous ramen chains in Tokyo since 1992, renowned for its slowcooked homemade soup created from high quality ingredients featuring the use of collagen for beautiful skin. 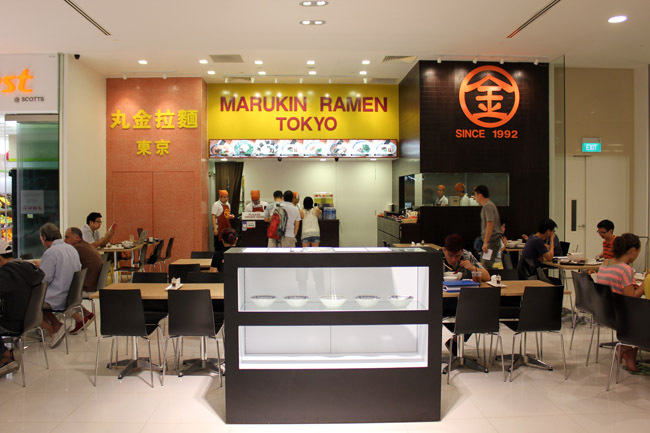 After making waves through its hugely popular franchise showing in Shanghai IFC, Marukin Ramen has made its way to basement one of the new Scotts Square at Orchard Road. The shop had an open and fastfood-like concept, which I wished that there was some form of enclosure like its neighbours Maison Kayser and Kuzumi. Customers were strangely sparse on a weekend too. 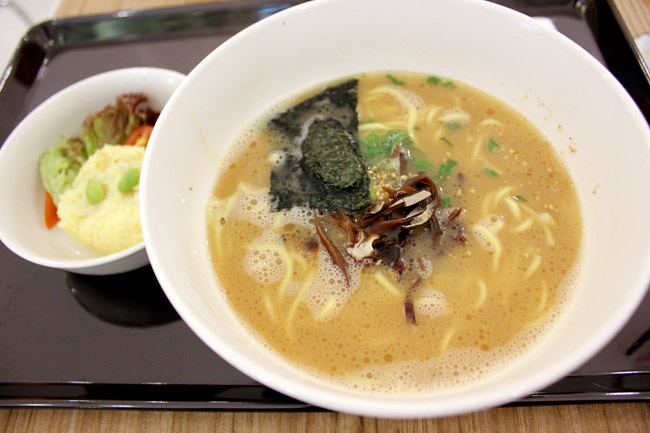 Varieties includes Marukin Shio, Shoyu, Miso and Spicy Hot Ramens all at $9.80. Instead of serving its signature Hakata style ramen made from pork broth, this local chain opts for a chicken stock for its soup base. I had the Marukin Ramen Set ($15.80) which came with potato salad and a bowl of mushroom rice. Talk about carbs overload. The plus point is that its Hakata style noodles are made-to-order, rather thin, non-curly and resilient with a QQ-bite. The ramen arrived in a cream-brownish coloured soup, and strangely does not feel too hot to the touch. 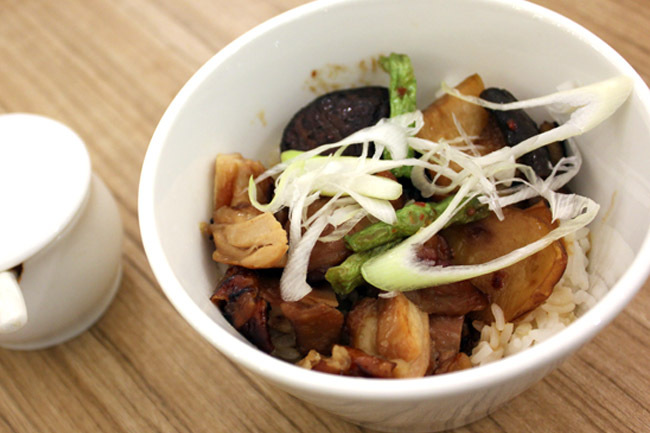 Its famed chicken-based broth is said to be a winning recipe cooked unhurriedly to perfection. However, it was a tad too salty, not milky enough and strange-tasting. Overall, the chicken ramen does not leave a positive impression, mainly due to the uninspiring soup base. 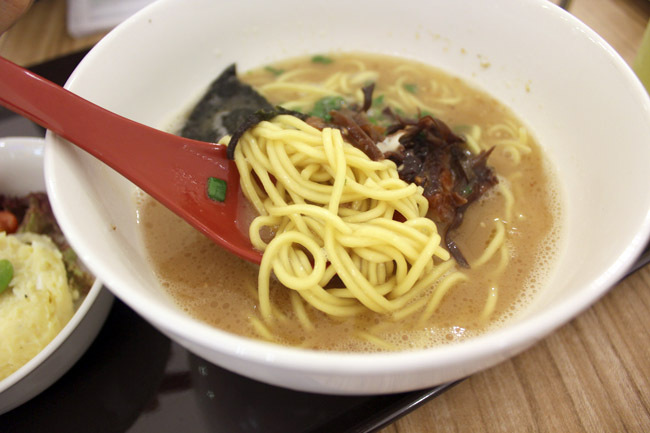 This is personal, but Hakata ramen goes better with rich pork-bone tonkotsu broth. Tried it, but really normal. One notch below santouka n ippudo. Generous on ingredients n value for $ though. Marukin is closed when I went over to Scotts Square few weeks ago.